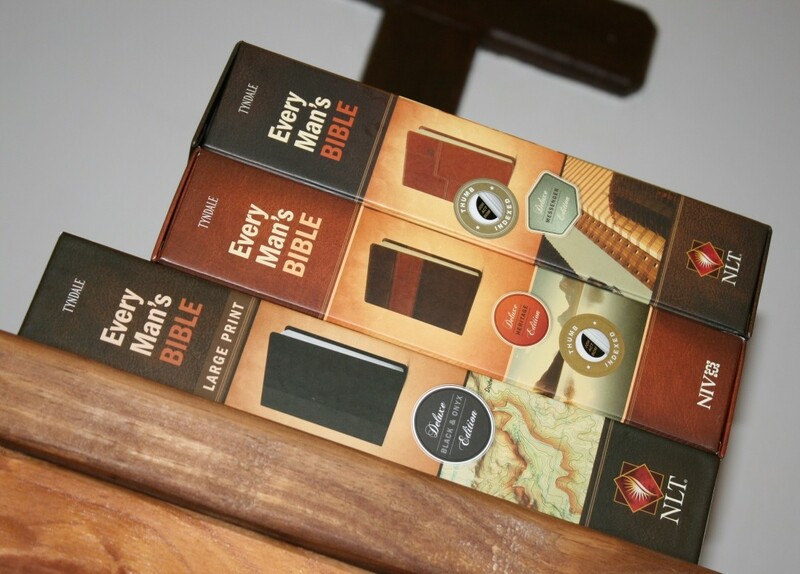 Every Man’s Bible is a study/devotional Bible written specifically to address issues that men face in their relationships with their wives and with God, and the challenges that men face in their roles. 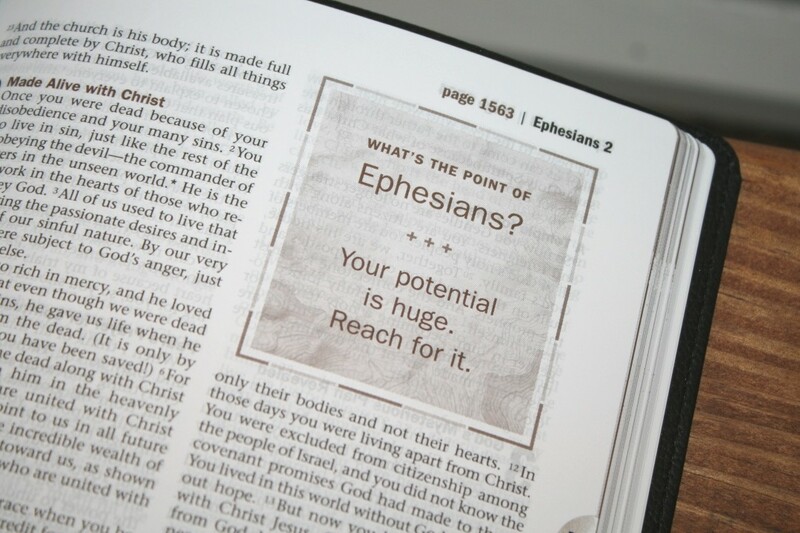 It’s available in NLT and NIV and in regular and large print. 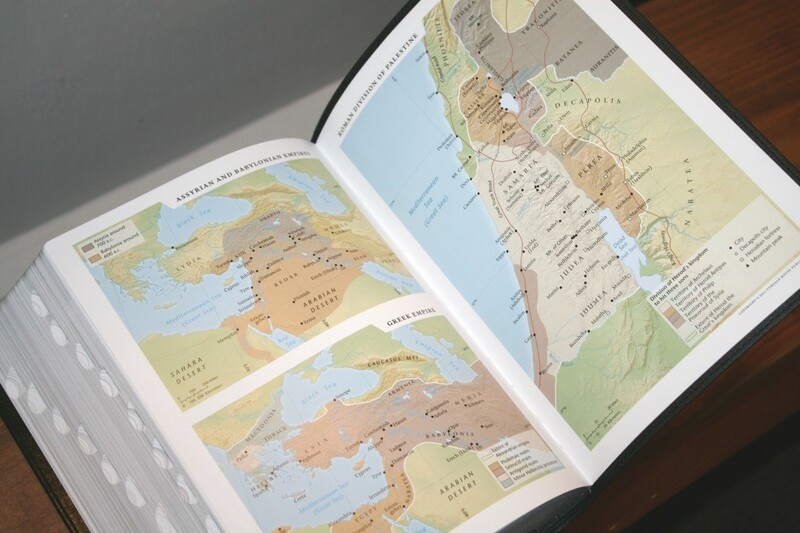 In this review I’ll take a look at three editions that will cover both translations and sizes. 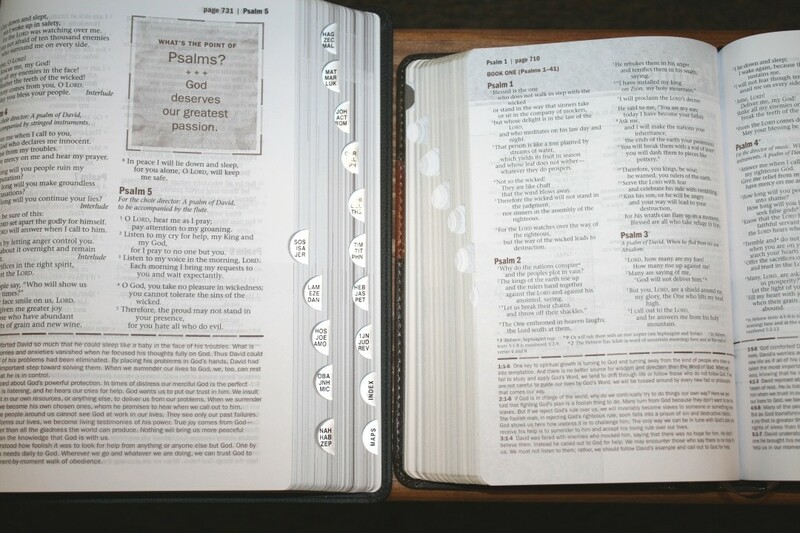 Tyndale provided these Bibles free for review. I was not required to give a positive review, only an honest one. All opinions are my own. 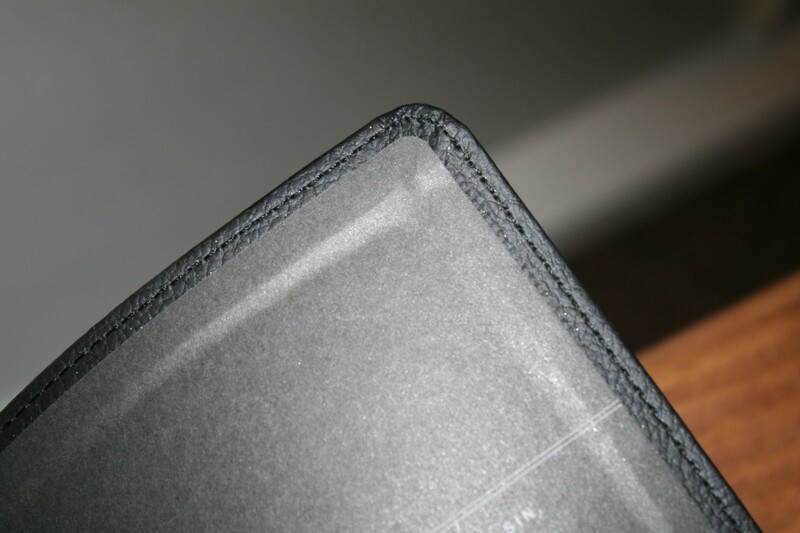 The covers are polyurethane with perimeter stitching and paper liners. 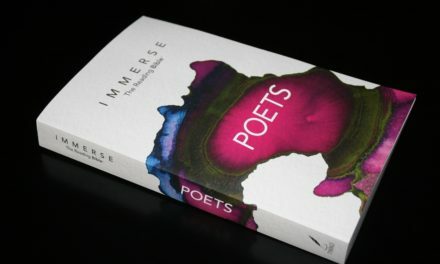 The regular sized editions have the title debossed into the front and spine, while the large print is only on the spine. The colors and grain look great. The liner includes Joshua 1:9. The regular size is 8.25 x 5.5 x 1.7″. The large print is 9.5 x 7 x 1.7″. From left to right: Large Print, Messenger, Heritage. 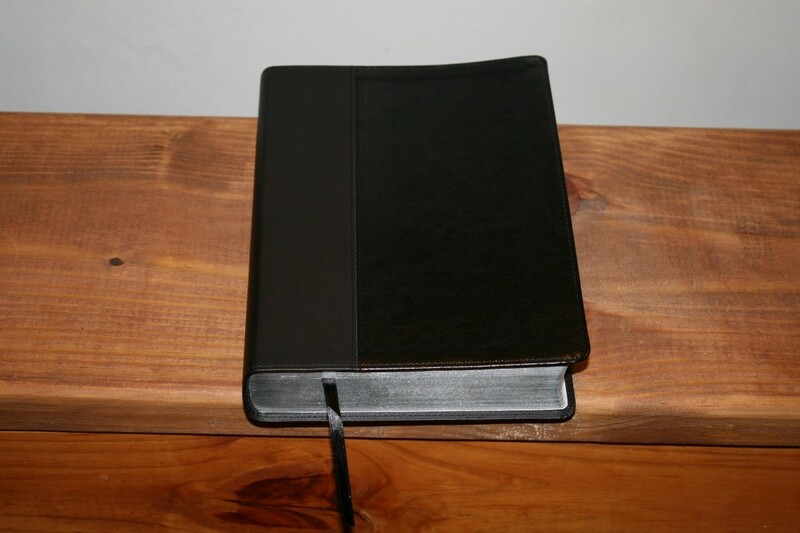 The regular size is great for carry and the large print is great for reading at a desk. The text-blocks are sewn. 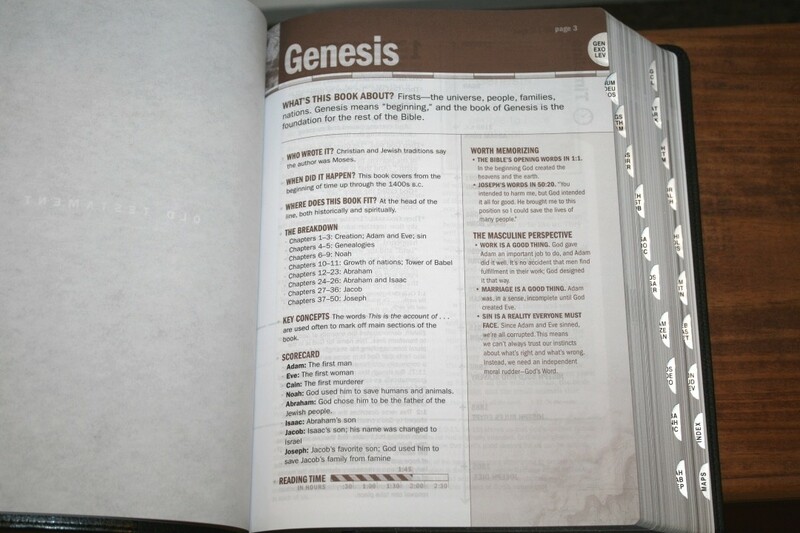 The covers are a touch stiff out of their boxes, so it will take some breaking in before they’ll stay open in Genesis. They include one ribbon and matching head/tail bands. 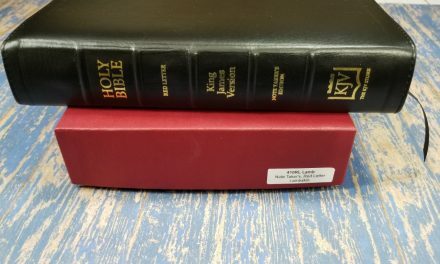 Each of these editions are thumb-indexed, with the standard 3 books per tab. The paper seems to be in the low to mid 30’s in gsm. It’s white in color and is highly opaque. It has no glare under direct light. It has a rough texture that I find easy to grab and separate with one hand. 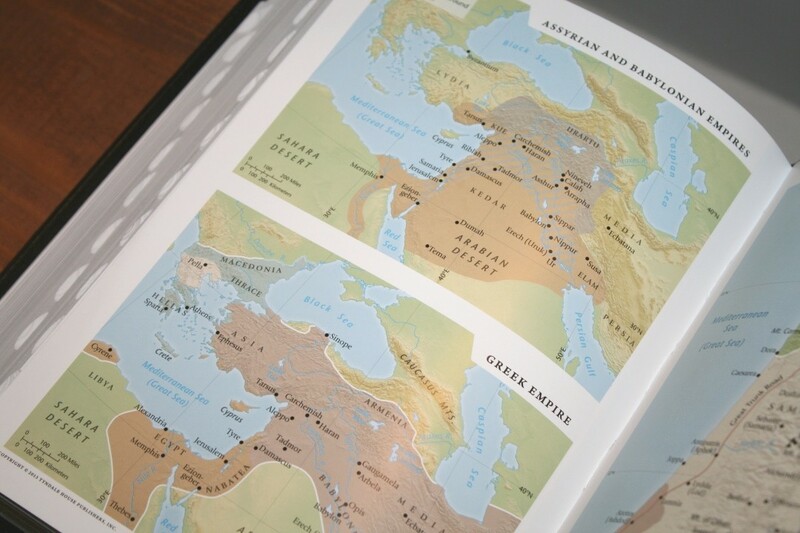 The regular editions have gold gilt and the large print has silver. 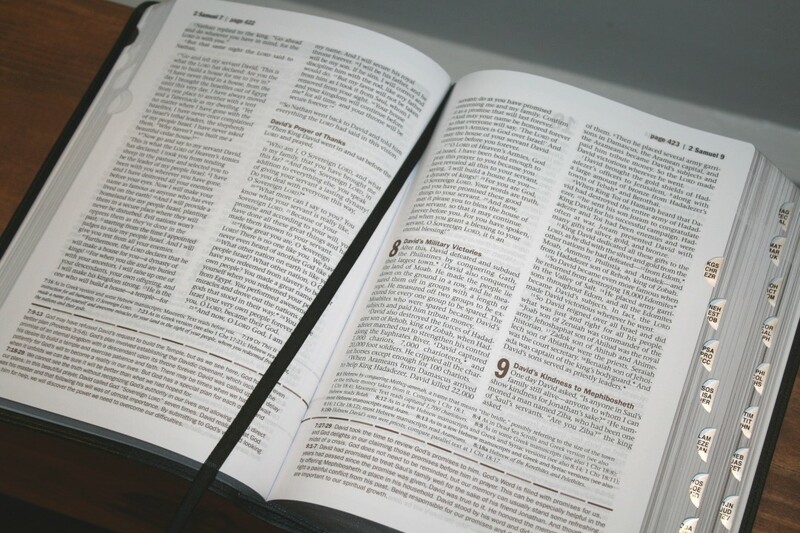 The text is presented in double-column paragraph format with footnotes under the text and study notes at the bottom of the page. 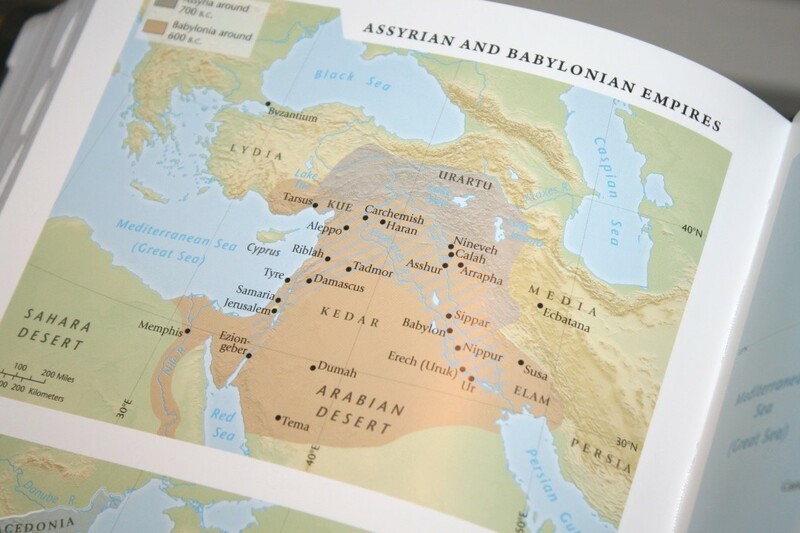 Other study material is placed next to the text. 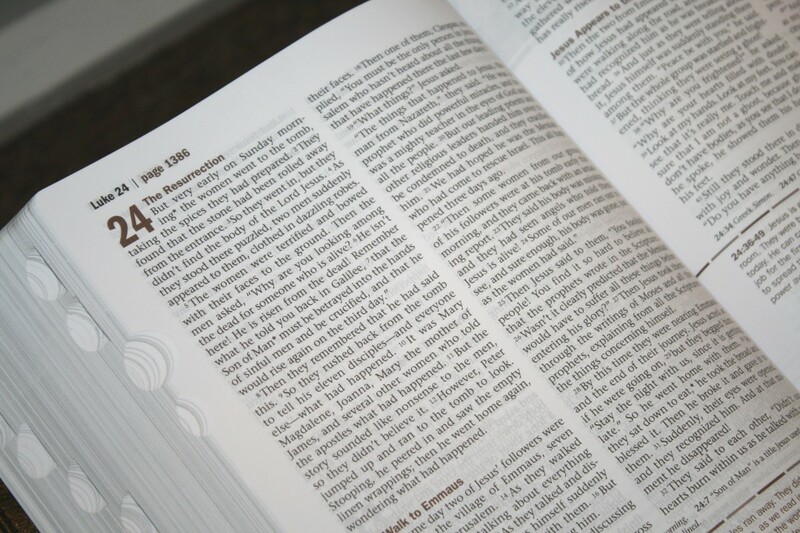 The header includes the book name and chapter number in the outer margin with the page number next to it. Highlights are in brown, giving this a masculine design. I like these colors a lot. The personal size has an 8 point font while the large print has 9 point. 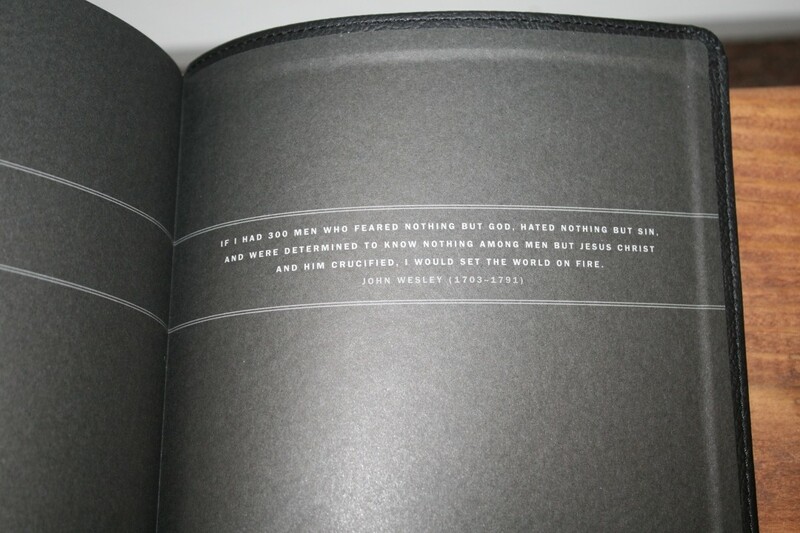 The text is black-letter with about a medium darkness. It’s sharp and consistent throughout. It doesn’t have a lot of distractions within the text. It has around 44 characters per line with around 7-8 words per line. The text doesn’t feel too tight. It doesn’t seem to be line-matched, but that’s only noticeable in the poetic settings and the show-through isn’t that bad. There’s enough room for underlining. Book introductions take about 1.5 pages and divides the page up into sections. 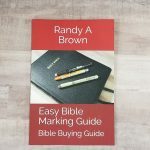 It covers what the book is about, the author, date, where it fits in the Bible, a short outline, key concepts, a scorecard which shows who’s who, the time it takes to read the book in hours, points to memorize, masculine perspective, and a timeline. They’re short and to the point but still provide some good information. 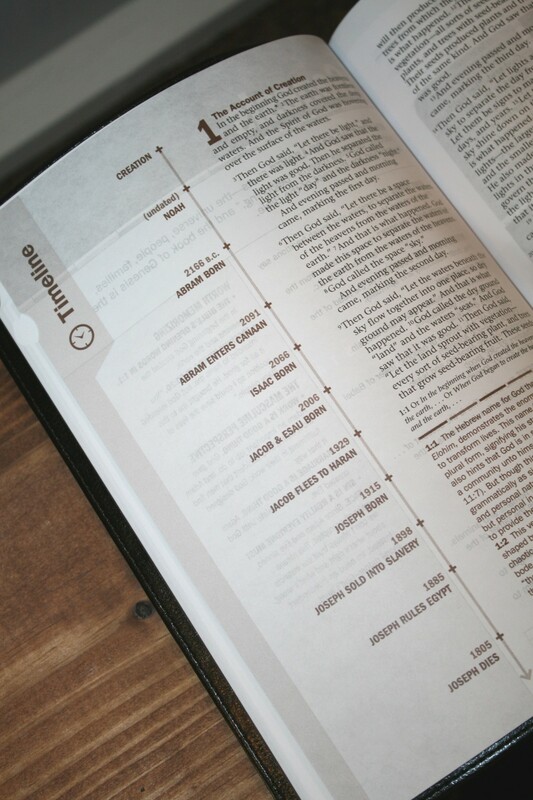 The sections on what to memorize and masculine perspective provide Scriptures, quotes, and major points that are applicable to men and relationships. 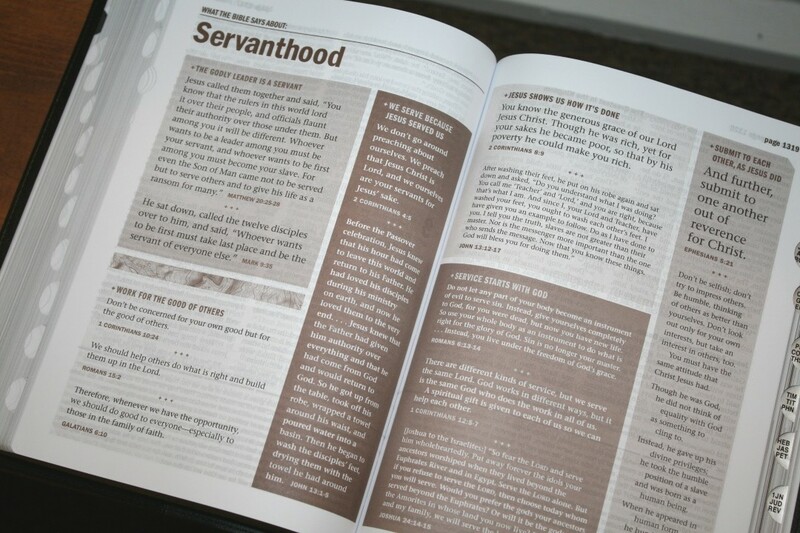 Most of the study material is focused on developing character for men. 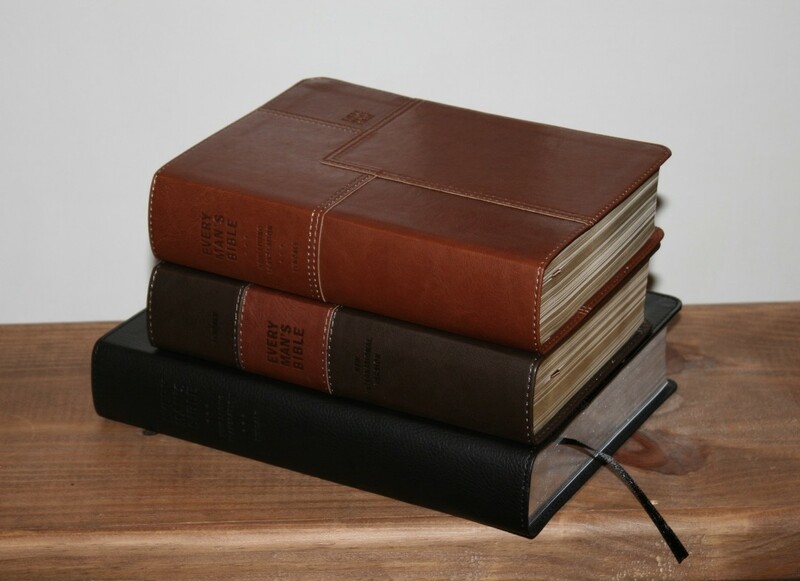 They have a devotional quality. 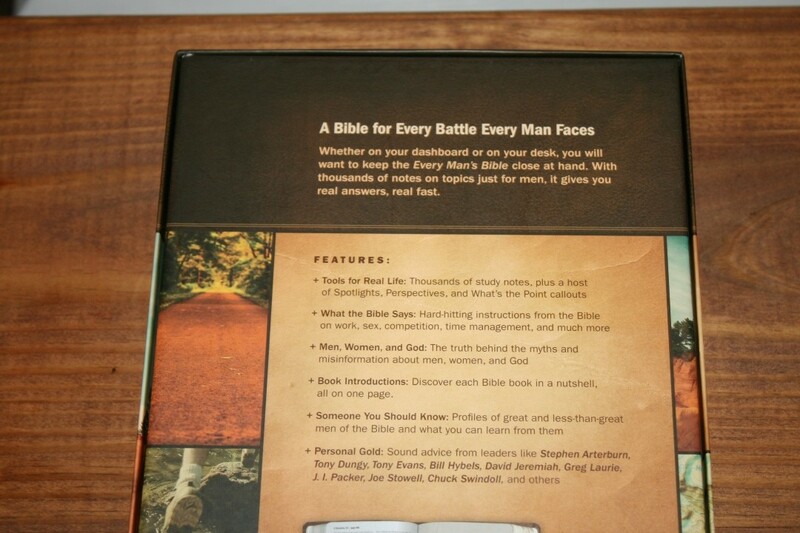 Some of this material is sprinkled throughout the Bible while others are placed at the front or back. 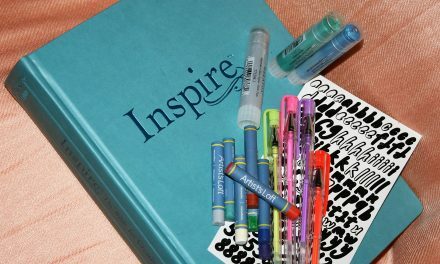 Study Notes – These are the notes placed at the bottom of the page. Some cover a single verse while others cover a range of verses. There are usually 2-3 notes per page. 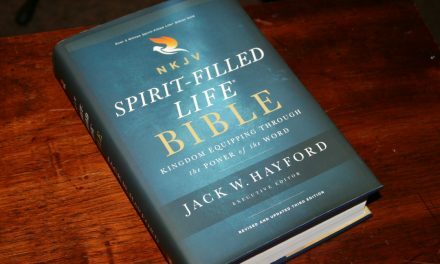 They include Scripture references, which is helpful considering this isn’t a reference edition. Some do touch on theology, but they’re more application focused than theological focused. 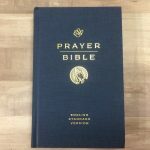 Men, Women, and God – These take about a half a page and cover a specific point about relationships between the man, his wife, and God. 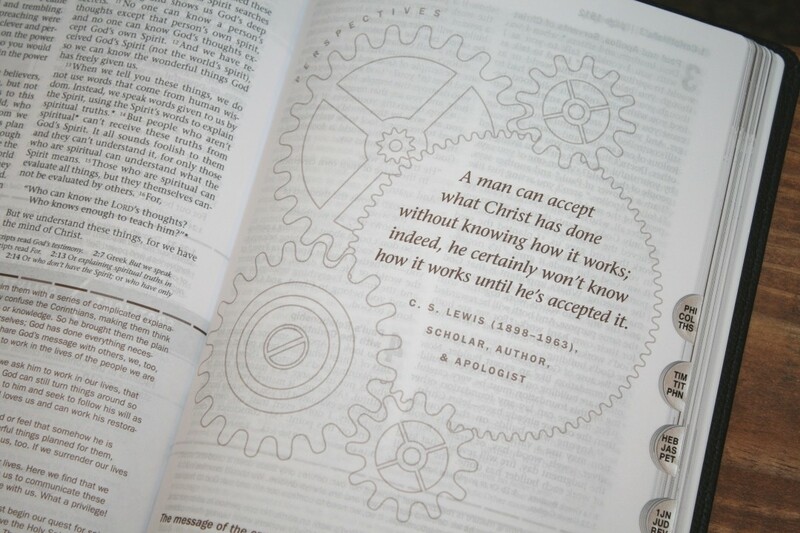 They provide the title, Scriptures, and a few paragraphs to build the point. They include examples. 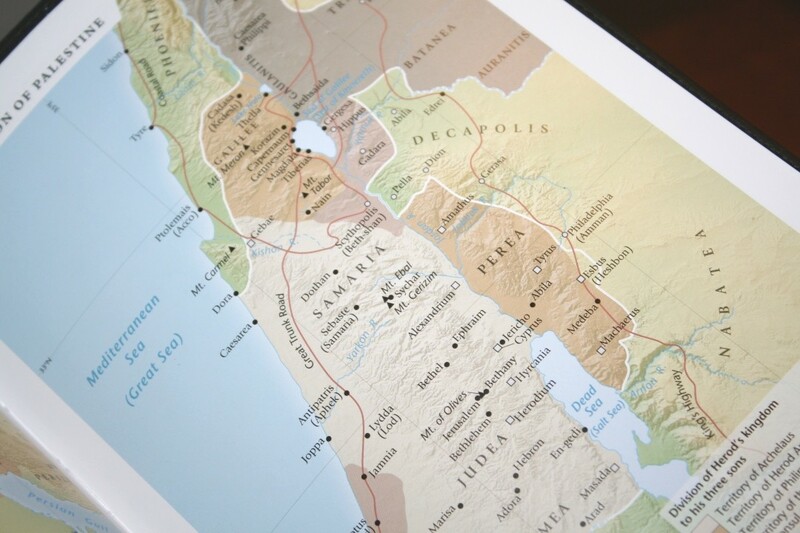 Someone You Should Know – This is a one-page article about a biblical character. It includes a title with definition, several paragraphs about the person, and ends with a short sentence called The Point that summarizes the main point about that person. These are great for personal character development. 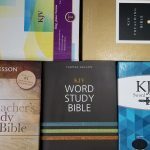 What the Bible Says About – These are one-page articles throughout the Bible that are broken up into multiple sections that include title headings with Scriptures about the topic. Most include around a half dozen verses or more. 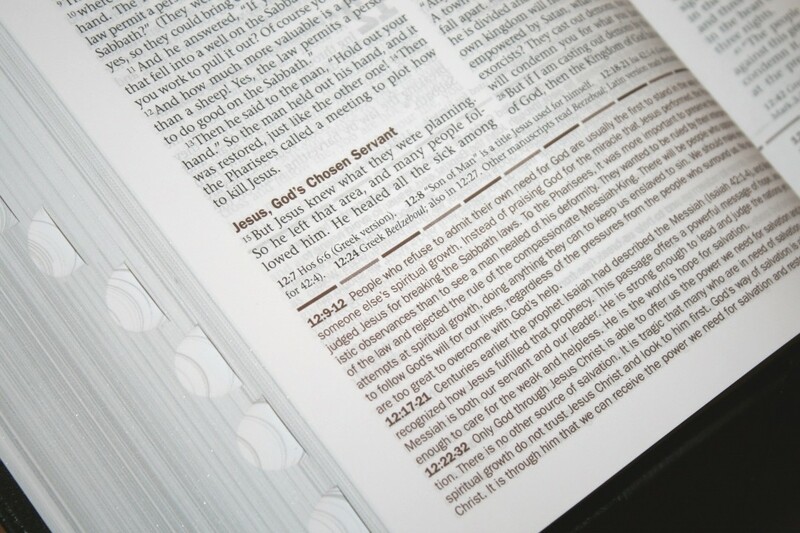 Spotlight – These are placed at the bottom of the page and focus on a specific point. They ask several questions with multiple choice answers. The answers are under the questions but turned upside down. These work great for trivia questions or to test your knowledge. Perspectives – These are full-page, but short, insights from popular writers in history. 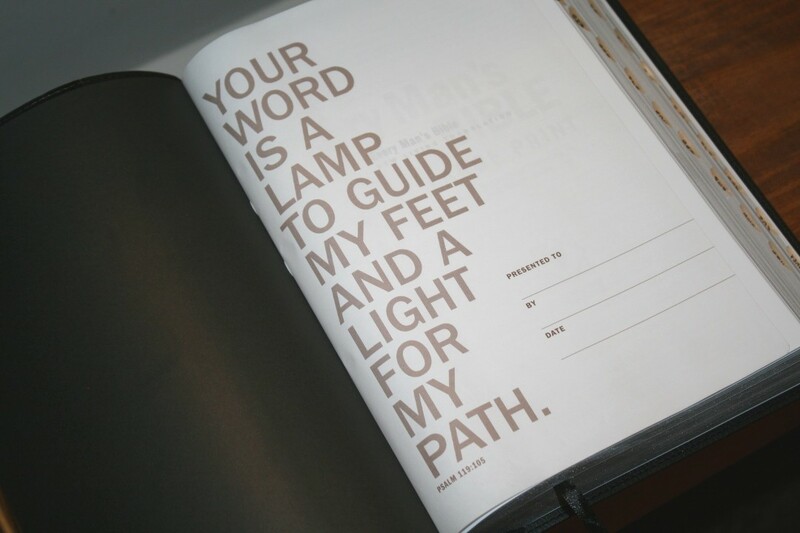 It provides a short quote, the author’s information, and a Scripture that it ties to. 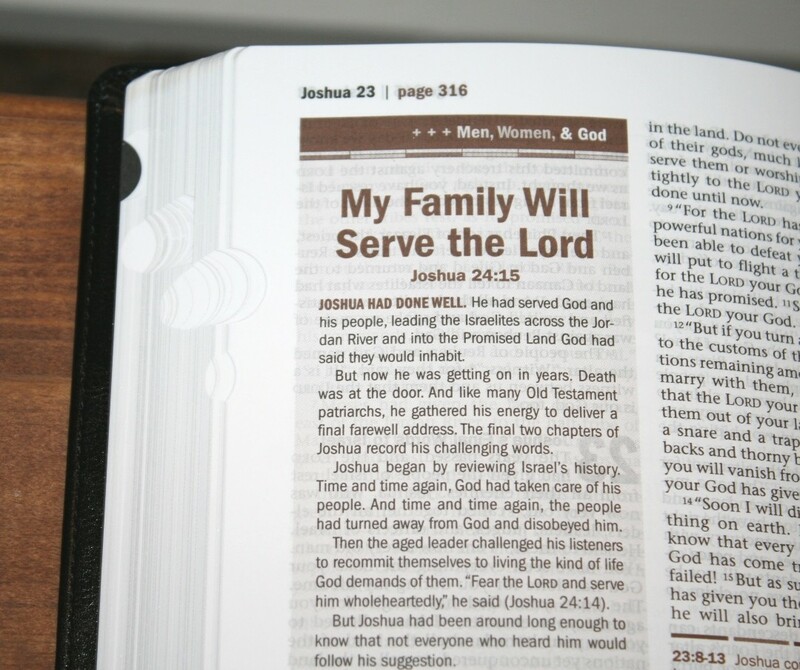 There are 26 of these throughout the Bible that are placed next to the verses they correspond to. 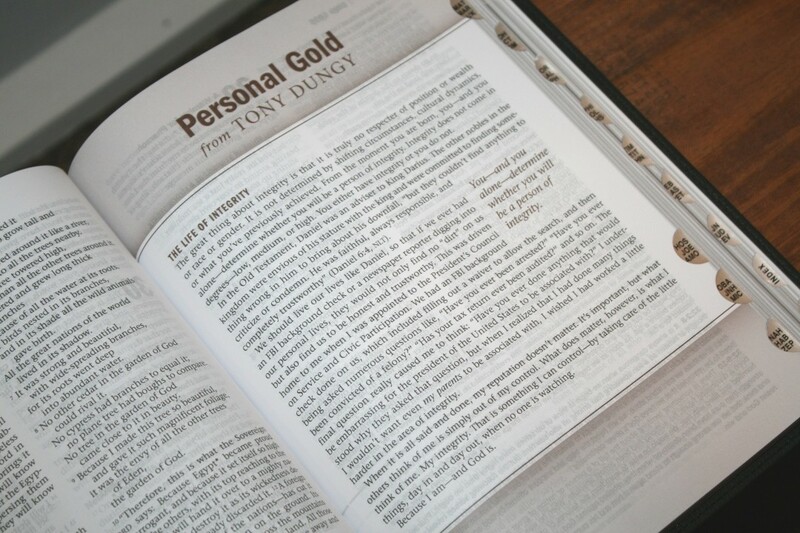 Personal Gold – These are one-page articles about Christian living. They’re written by by popular authors throughout history. 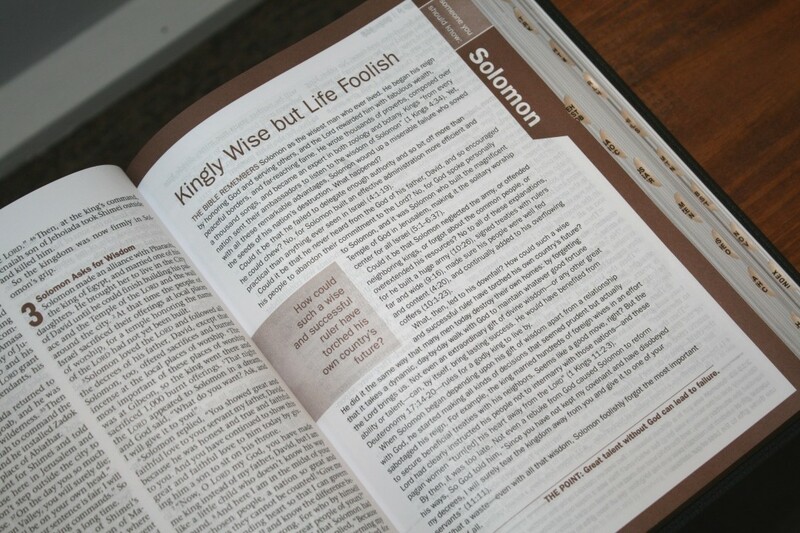 They deal with a specific point about life and show examples in Scripture. 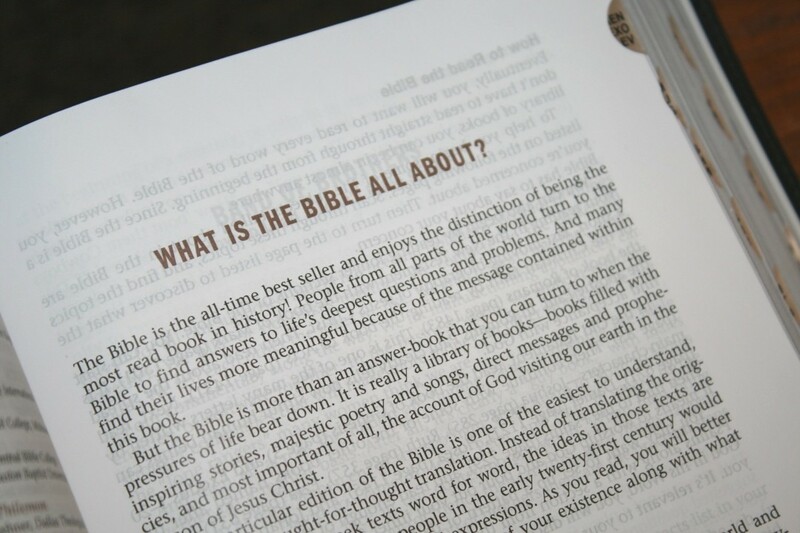 What’s the Point – This is a call-out box that asks the question of what’s the point of that specific book of the Bible. It then answers that question with a single short sentence. 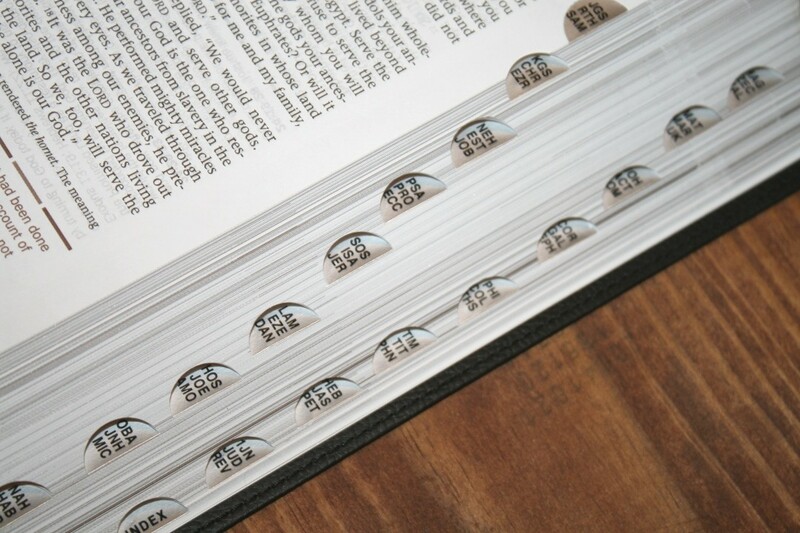 They’re placed near the beginning of the book, usually on the second page. 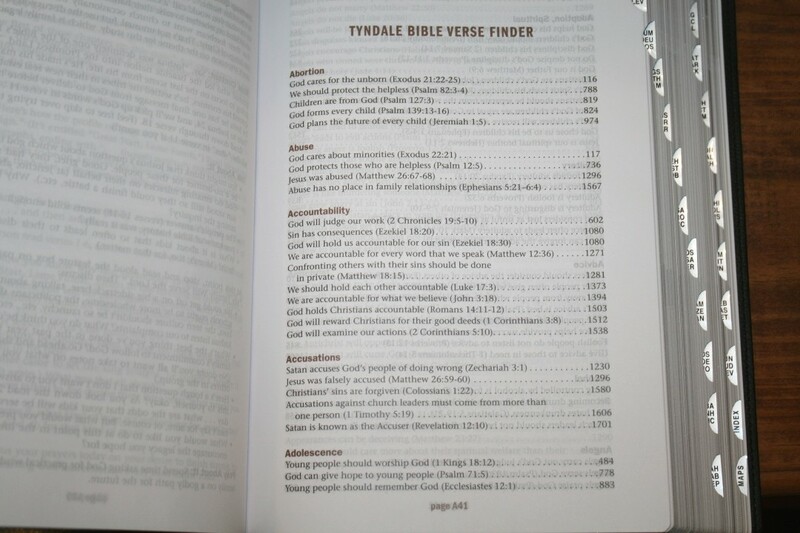 Tyndale Bible Verse Finder – This is one of the larger features in the front. It provides a topic name and several passages that discuss that topic. The passages includes a description. 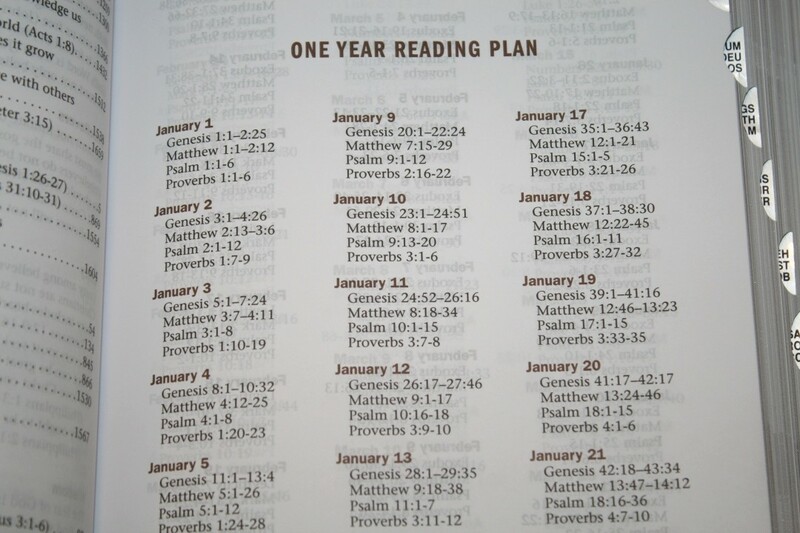 Reading Plan – This is a one year reading plan that breaks the reading up into four places from Scripture. 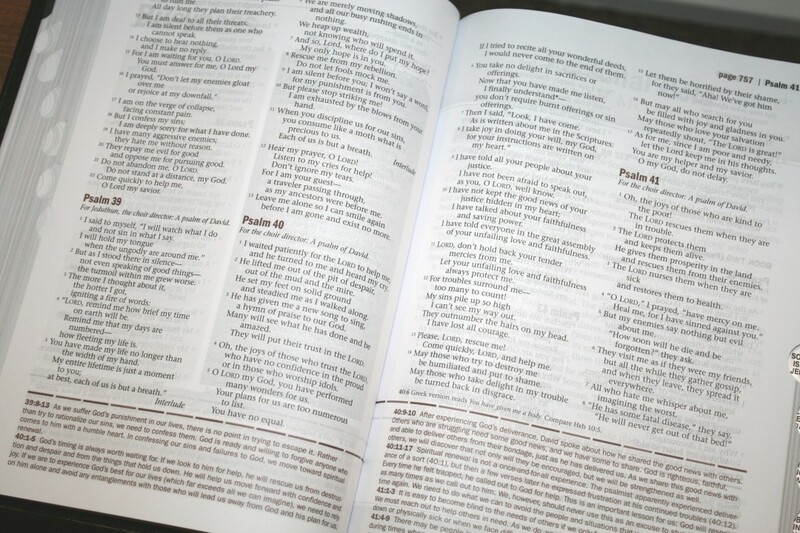 They include the date, a reading from the OT, the NT, Psalms, and Proverbs. 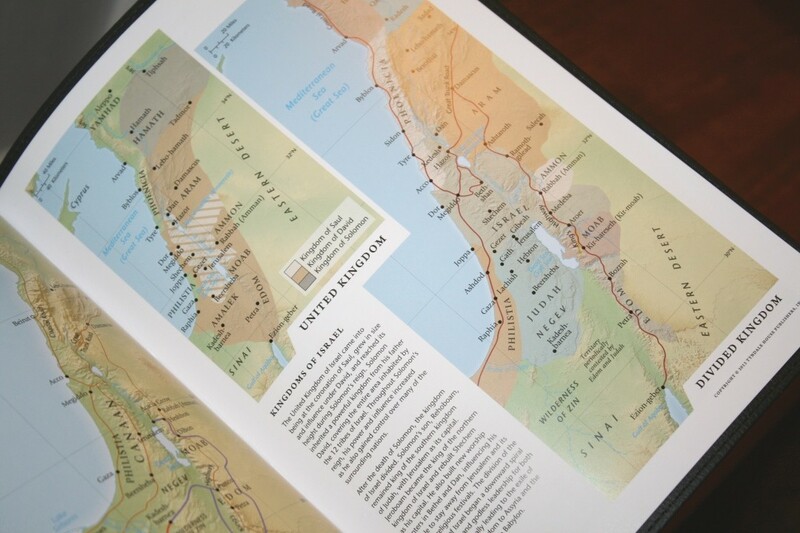 It has 8 pages of full-color maps on thick glossy paper. I love these colors. They’re not too bright and not too dull. They look sharp. It doesn’t include an index, but they are annotated well. 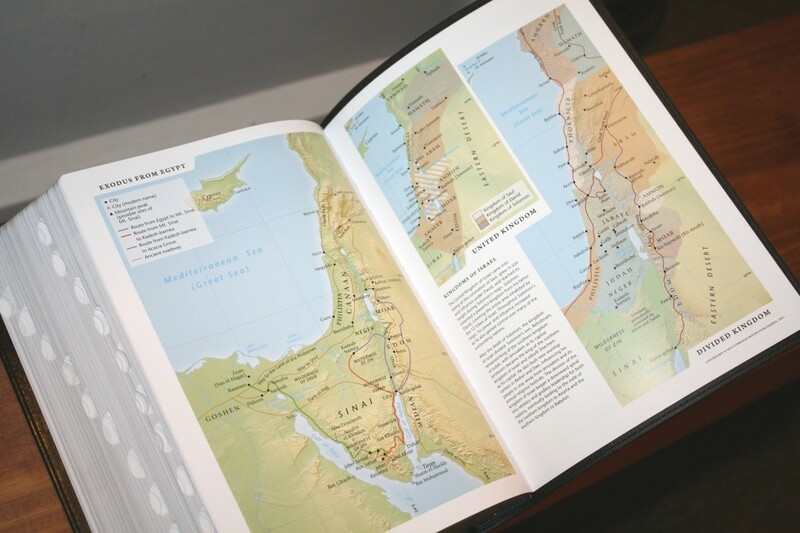 They include average rainfall, journeys, cities, routes, distance, bird migrations, roadways, kingdoms, dates, realms, territories, mountains, locations of events of Jesus with Scriptures, and simple topography. 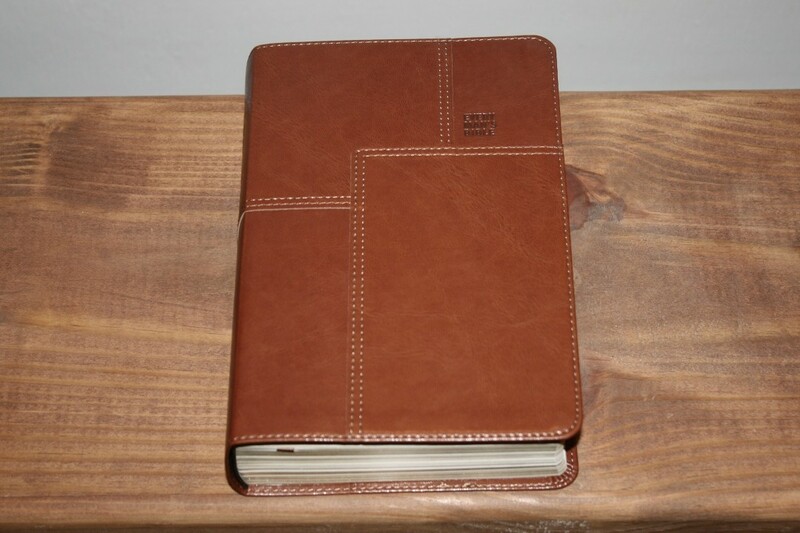 Every Man’s Bible is an interesting study Bible. 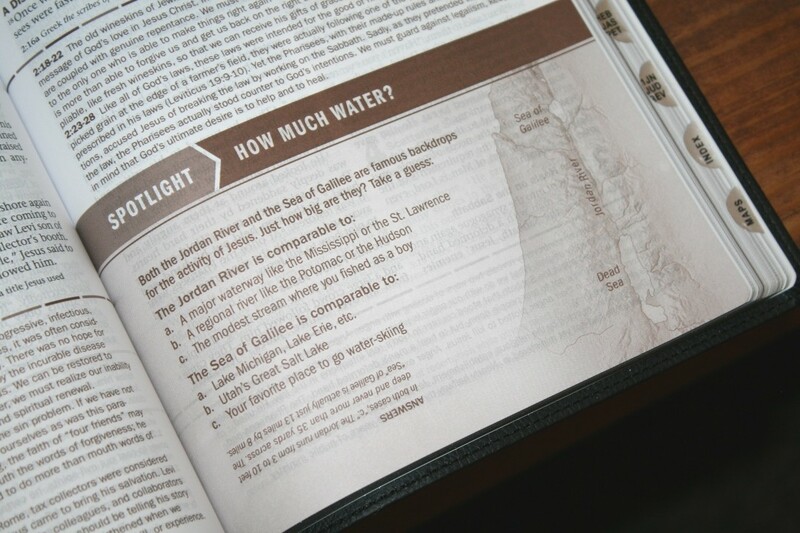 It has lots of study material that you’d normally find in a regular study Bible, but the material is focused on issues that men face in their walk with God. 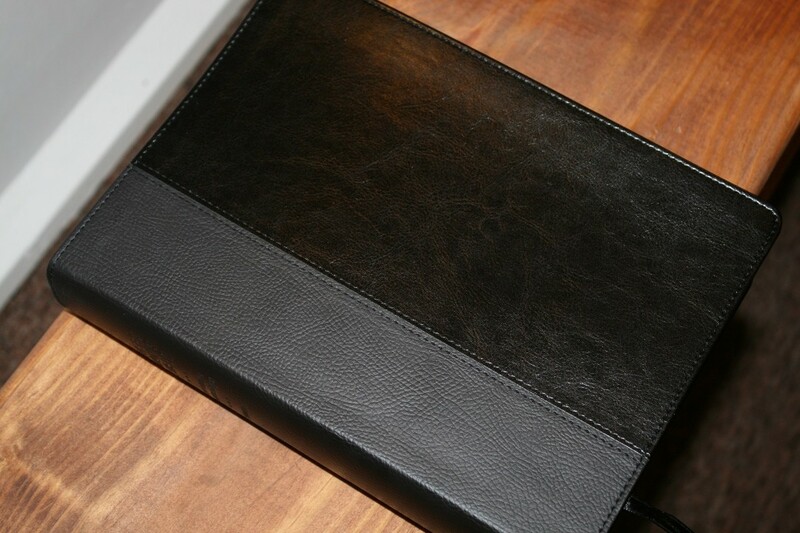 Even the commentary has a devotional quality with an application. 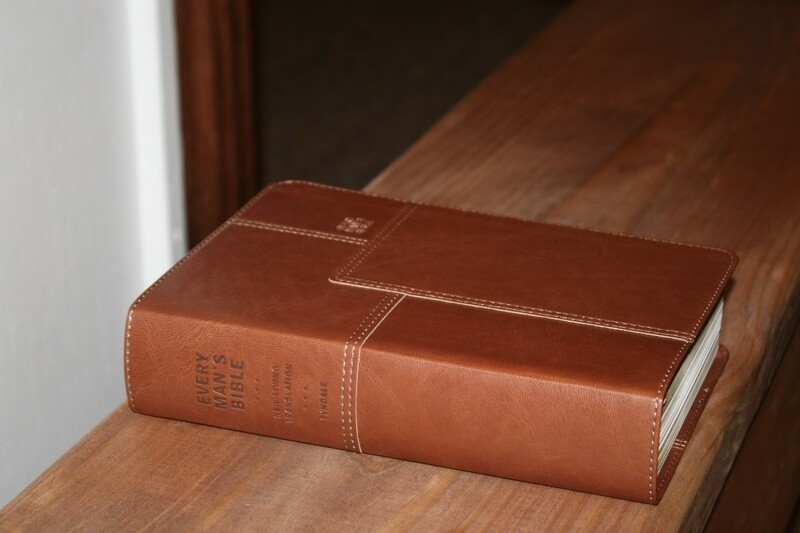 The extra material doesn’t get in the way of reading the Bible. It’s constructed well and I especially like the colors and styles they chose for the covers. 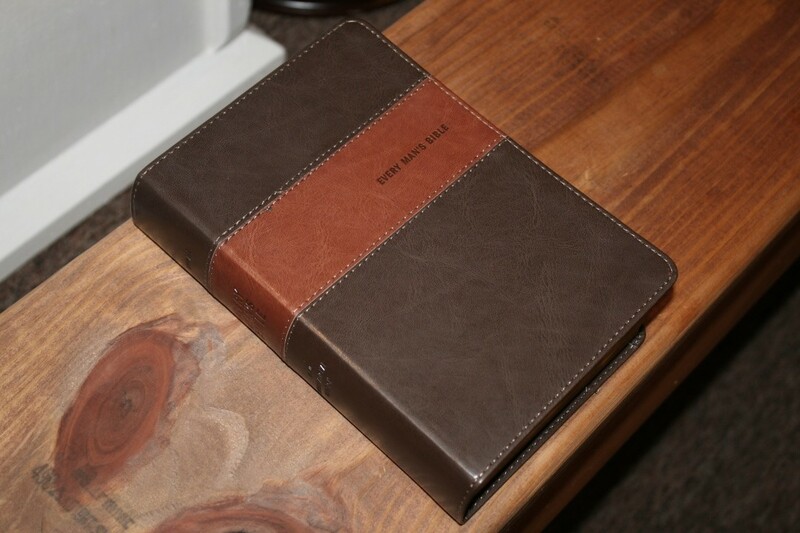 I recommend the Every Man’s Bible to anyone looking for a study Bible with a devotional quality for men.